Afternoon open for rest and altitude acclimatization. In the evening we will enjoy a very nice welcome dinner in a local restaurant featuring delicious peruvian cuisine and live traditional music and dances show. This is Day 1 for the Apurimac River Rafting trip. Begins with a four hour bus ride to the Apurimac river. The first stop is at Izcucahaca, small town where we can buy the last supplies for the trip. We will have some more rest stops times along the way including Condorhuachana (place where Condors fly), where we can have the first view of the Apurimac River canyon from 2000 meters high. This is a perfect place to take pictures and enjoy the scenery. Once at the river shore guides and passengers will organize the expedition, you’ll then pack your gear into the dry bags. After packing a picnic lunch will be served. , Then rafting technics and instructions will be given by the trip leader. He will go over the safety features for the trip and demonstrate techniques for paddling, floating and rescue, this briefing will be followed by a practice in the river, each passenger takes turns swimming in some moderate rapids so everybody can practice grabbing the safety kayak and the secure rescue lines and also we will practice flipping the rafts so everybody feel safe, good and comfortable to start this great adventure. 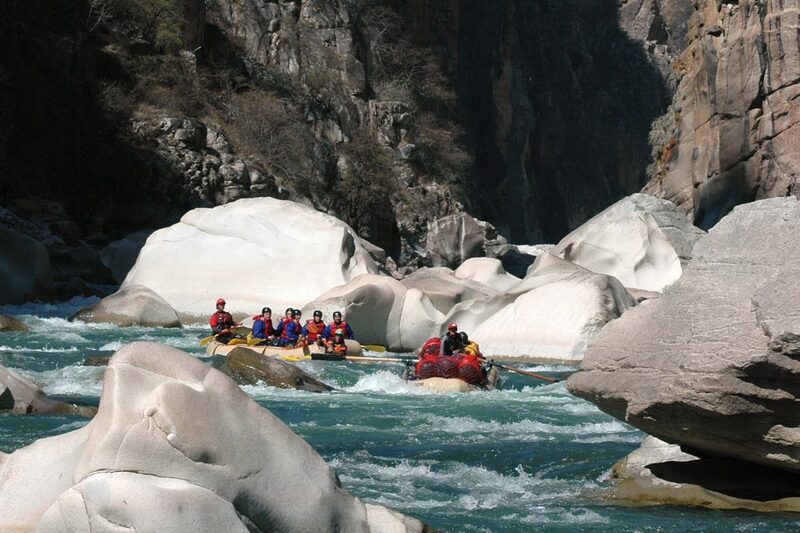 Then, it is on to the river!, fun level II and III rapids and peaceful calms and magnificent scenery. After the initial stretch of river, we arrive to the first level III+ rapid (Level IV in May and early June) called the little Z, after a series of more good rapids and beautiful scenery we reach a very nice water fall before arriving the camp site later in the afternoon. We organize the camp on a sandy beach called Las Paltas. After a brief camp orientation where you’ll become acquainted with the place, our solid waste toilet system and the camp routine, you can enjoy an afternoon snack and relax, as the guides make the first of many delicious meals. In the evening the twilight consumes the canyon while listening the river sounds and the tales and experiences on the Apurimac river by the guides . We will have a briefing about the next day before we go to bed. Don’t say no to the Apurimac starry night invitation to sleep outside the tents. 8am The day begins with a delicious organic breakfast. Then we have to pack up the camp and reload the rafts for the day’s river adventure. 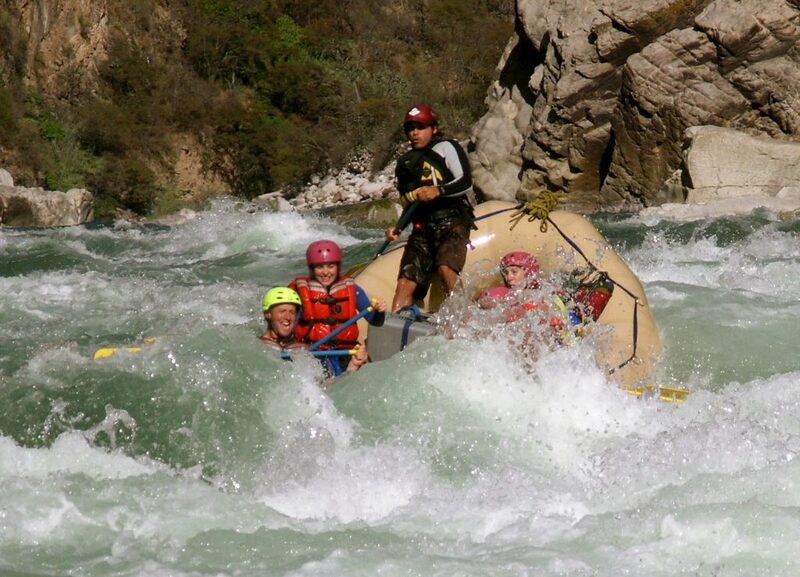 We jump into the rafts at 9:00 am and our way through the Apurimac canyon wilderness continues. Today features some of the best rapids on the river. Just around the corner from camp, we have many level II, III and III+ technical rapids until we arrive El Chute level IV. You can enjoy the spectacular scenery of the Chute gorge as you travel toward The Portage rapids, in this place passengers need to walk around it, carrying the dry bags while the guides will be taking the rest of the staff. After the portage, we rest before arrive the Minefield canyon with a series of level II, III and IV rapids until the Apurimac river calms in a fantastic place where we can see impressive rocky formations that the river and other natural agents have built over millions of years, here we can jump from a cliff and swim, after this we arrive the Purgatory rapid level IV, in this place the whole river flows on the left hand side of the canyon near a massive wall, creating big waves and powerful currents, making this rapid one of the best in the River. Before we run this rapid, the guide will explain how to run it and where the safety kayak and the guides with the secure lines will be located and then, we will start running the rapids one by one until everyone finish running the rapid safely; after this we will have one more portage. One hour after, we will see another river called Vilcabamaba that joins the Apurimac. A couple of rapids more and we will arrive a sandy beach to have lunch, while the guides cook here you can take a short walk to explore the unique geography of the Apurimac river Canyon or cool off swimming in the river. After lunch there will be more rapids: Las Tres Marias, The Z, Indiana Jones, The rollover and Window, all class IV rapids with nice waves and holes. In between this rapids there are many other rapids level II and III and then, we arrive to another big rapid El Trinche level IV (Level V from May to June), in the beginning there are waves an holes with some rocks and right before the end a big hole is awaiting, the guides need to maneuver and go through it without any problems, few minutes more and we will be in The Table and the No Name rapids all level IV. Before we arrive the campsite, we need to collect wood for the campfire. Guides will assist with setting up the camp and then you will be free to read a book on the beach, take a hike with spectacular views of the Apurimac Canyon, or a refreshing swim in the river. After unwinding for a few hours, the Guides will have a delicious hot meal ready for you. After dinner you can relax with a cup of coffee or tea next to the campfire under the stars playing cards, telling more river stories, and re-living your best adventure moments from the river day. Another hearty breakfast prepares you for today’s journey. The river starts out with exciting rapids so be prepared for a thrill from the beginning. During the first hour we will raft through fun and challenging rapids like Wake Up, Ramona, and the Labyrinth all rapids level IV, minutes after we will be in the biggest rapid of the Canyon The Toothache where passengers have to walk around it, just river guides will be able to run this rapid in order to minimize risks. Immediately after this rapid, we will have the last portage. After this there will be a section of rapids level II and III until we arrive to Babaluba rapid grade V, here we organize the safety: the first to run the rapid will be the kayak, followed by the luggage boat and once everybody is properly located in the passengers’ boat we will start running the rapid. In the first part, the river goes through small channels with many rocks, after that the river gets calm, and then it changes dramatically while the boat is jumping through drops and holes. We have only few seconds to rest after Babaluba, because The Last Laugh rapid level IV is waiting for us. 2pm the Cusco Cycling Adventure experience begins: We go on the best off the beaten path downhill trail near Cusco: Yuncaypata. Will pass by Pucapucara up to Kenko, Sacsayhuaman, Lanlacuyoc and Kusilluchayoc Inka temples. Following an ancient inka trails on the hills and through narrow stone paved stairsways in San Blas neighborhood, Teteqaqa sanctuary, The Twelve cornered stone, The Seven Snakes street and finally we arrive the heart of the Inka’s Empire: the Cusco’s main square, on our bikes. Overnight in the selected hotel in Cusco. 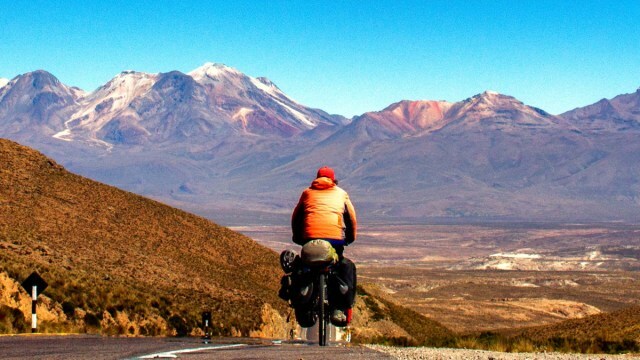 After Breakfast we go to ride on the Sacred Valley of the Inkas for a Full Day bike trip visiting the impressive Moray archaeological site after some three hours XC cycling surrounded by the scenic beauty of the valley. Rest stop here to enjoy a very nice outdoors buffet lunch specially prepared by our cheff. After lunch follows a very exciting downhill ride by ancient inka trails toward Maras pre-Inka salt mines. We will have a brief guided visit here. Then continue descending to the bottom of the valley at the river’s level to meet our private transport vehicle. We spend this night in a very nice country lodge on the Sacred Valley of the Inkas near Calca on the shores of Urubamba river. After early breakfast we go on an amazing full day MTB tour starting from the Huayracpunku 4,300m pass to ride on the best downhill trail in South America: The Lares ride along a section of the ancient Inka Trail surrounded by spectacular panoramic views of the Vilcanota range. After 4 hours of spectacular downhill ride we will arrive Calca village on the Sacred Valley of the Inkas, rest stop here for another very nice outdoors buffet lunch. In the afternoon on our private transport we go to Ollantaytambo to visit the village and the archaeological site. Unique and interesting since local people on present days are still living in ancient inka palaces and houses built 500 years ago. Afternoon tourist train trip to Aguas Calientes, the village at the foothills of Machu Picchu. Overnight in a local hotel in Aguas Calientes. Early breakfast. Today we go on a full day tour to Machu Picchu. Transfer with local bus to one of the Seven Wonders of the World. 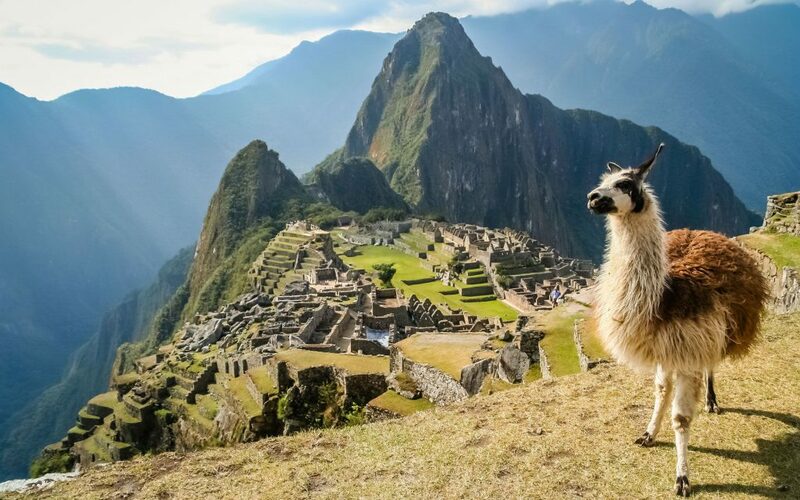 Then follows a 2 hours guided tour in Machu Picchu featuring the most interesting aspects of this wonderful site. Afterwards we have open time to freely visit the site and venture to climb the nearby Huayna Picchu peak. 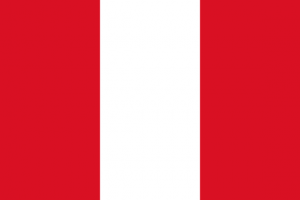 In the afternoon with tourist train transfer to Ollantaytambo and on by bus to Cusco. Transfer on our private vehicle to 5,000m altitude Tink’i pass for biking on never ridden before inka trails down to Marcapata, an alternative way toward the amazon rainforest. On the way we will stop for rest and have a box lunch. At Marcapata we will stay in a nice lodge and have a nice swim in the local hot-springs. After breakfast we continue toward the Quincemil jungle village. 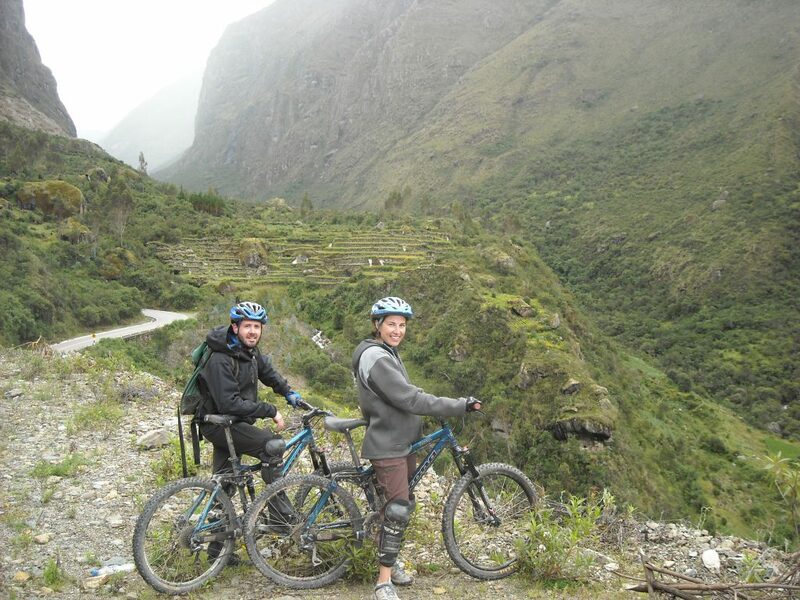 The ride is on alternating dirt road and inka trails. Box lunch on the way. We will spend the night in a local lodge. Return to Cusco. Early morning departure . 3 hours transfer back to Tink’I pass. From here we go by bike alternating dirt road and inka trails down to Ocongate to finally continue on the vehicle to Cusco. INCLUDED Private transport service on all tours. Accommodation in hotels and lodges as listed in the program,. Entrance fees to all historical and monumental sites visited.